*Make your own chili seasoning here. Served with organic corn tortilla chips for dipping and crunch or corn bread ~ Yum! Heat the olive oil over medium heat. Add all the vegetables through the garlic and saute for about 5-10 minutes until softened. Add the beans through the salsa and spices. Stir, cover and simmer for 1 hour. Scoop and serve with your favorite toppings. It makes about 6-7 1 cup servings. 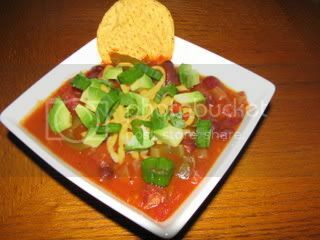 This is a very low cal recipe that is so feeling and satisfying. The Husband and I really loved it. 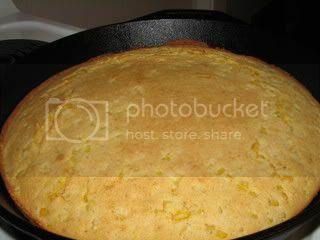 He had chips with his (which I stole a couple) and I had this Vegan Skillet Corn bread with mine. The corn bread is definitely not a sweet bread even though I used vanilla soy milk. I topped my 1 1/2 slices with a little vegan butter and honey. Yum! After I put the chili on and the corn bread in the oven, I settled down for a Quick 20 minutes of Gentle Hath Yoga from yogadownload.com. This has to be one of my favorite ones ~ it’s all about relaxing, stretching and letting everything in your day go…..Ahhh! It really made me want to do nothing after though. Good thing dinner was pretty much done. I am off to read, relax and maybe watch a movie with The Husband again. We picked up 3 on Friday that we are slowly making our way through. Your chili and cornbread look delicious. I did the same Gentle Hatha download as you. It felt great. Kirwin ~ It was so easy to make – this might work for you on tutor night maybe? Glad you enjoyed your yoga. Sara~ It is so great to see you post! Yes, do stop by and comment any time. I am planning on adding a recipe section as a way to store them all once I figure out how to just add them 🙂 You should definitely join in on yoga – you will love it. Check out yogadownload.com – there are alot of free sessions there that you can do anywhere. You put them on your ipod/mp3 player. Chili delicious. I recommend adding a little bit more spice to it-giving it a little kick. My husband loved it as well. 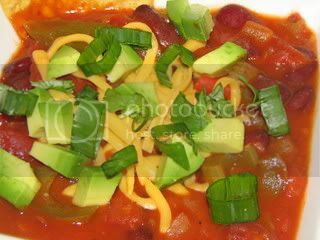 Rachel ~ I totally agree – spicy chili is the best. Glad you enjoyed it!